BADBADNOTGOOD - Late Night Tales: BADBADNOTGOOD. Vinyl LP, CD. Bleep. BADBADNOTGOOD have great taste. 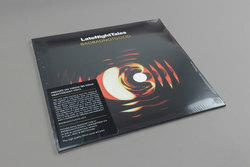 If this wasn’t apparent from the menagerie of guests across their LPs, their collaborations with the likes of Ghostface Killah and Kendrick Lamar and their catalogue of covers ranging from Gucci Mane’s ‘Lemonade’ to My Bloody Valentine’s ‘You Made Me Realise’, then let their Late Night Tales put this one to bed forever more. This one’s got something for everyone: those who like their mixes to read more like mixtapes from a loved one should try the opening run of funk and soul numbers; if you’re craving a beat, go straight in at Soundway’s reissue of Kiki Gyan’s ‘Disco Dancer’; for something more cerebral, take in the weightless second half. Still not satisfied? Then there’s a new BBNG bit at the end.